PICK HONEY. NEVER DROP A PLECTRUM AGAIN. Location: /Instruments/Banjo/Ukulele-Banjo/OZARK BANJO-UKULELE. A COMPLETE PACKAGE. EVERYTHING YOU NEED. INSTRUMENT STAND, ELECTRONIC TUNER, INSTRUCTION BOOK. The hoop is built from mahogany and is 203mm (8”) x 15.87mm (.625”). A brass tone ring is fitted to the outer edge of the hoop and gives the 'Arch top look' . 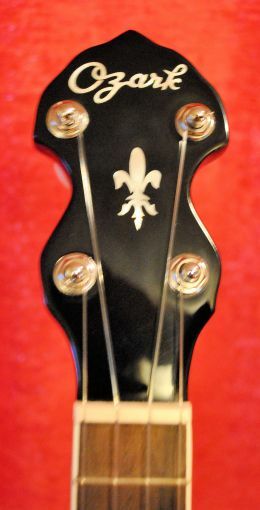 The tailpiece is the simple ‘No Knot’ type. All the hardware is chrome plated including the high quality geared machine heads. 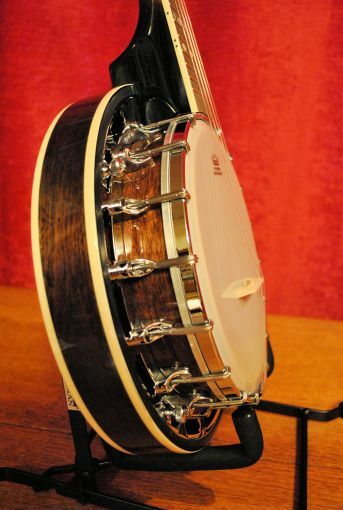 Fitted with an 8” diameter Remo ‘weatherking’ smooth white head and a Clifford Essex ukulele-banjo bridge. The Clifford Essex banjo-ukulele bridge, is hand made from well seasoned maple and has been designed specifically for the instrument. A bridge with an ebony top is not suitable for nylon or gut strings. The ebony is only inserted for steel strung instruments to stop the steel strings cutting into the maple. When an ebony topped bridge is fitted to an instrument designed for nylon/gut strings it dampens the tone. Four thumbscrews attach the resonator which is constructed from mahogany. It has a convex back and is bound on the outer edge in matching ivory colour binding. 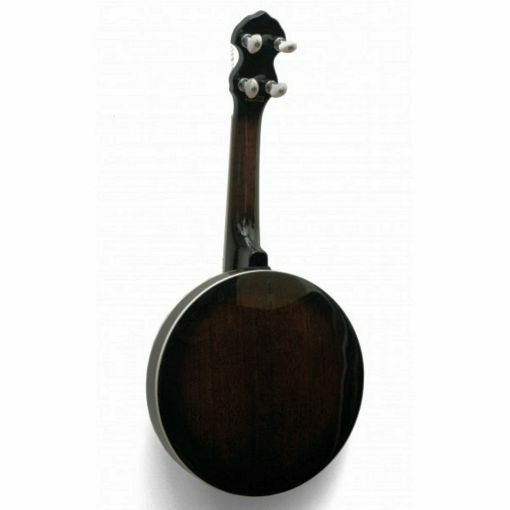 The resonator is stained brown mahogany and is clear lacquered and highly polished. The neck is attached to the hoop with a single lag bolt and one co-ordinator rim rod which give you the facility to adjust the ‘action’ if required. The neck is made from mahogany. 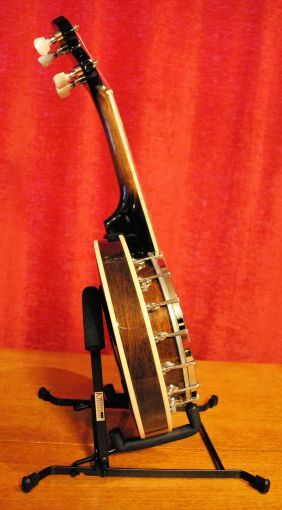 The 15 fret fingerboard is bound to match the resonator and inlaid with diamond shape pearl inlays and small black side dot position markers at the 5th, 7th, 10th & 12th frets. The peg head is black finished and inlaid with a script ‘Ozark’ logo. 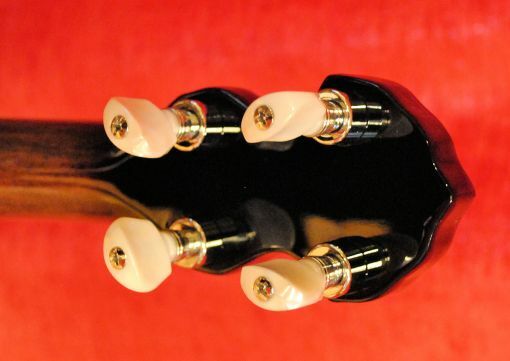 A set of geared tuners are fitted to the headstock. The tuners are chrome plated to match the hardware on the hoop. The neck is stained, clear lacquered and polished to match the resonator and body. 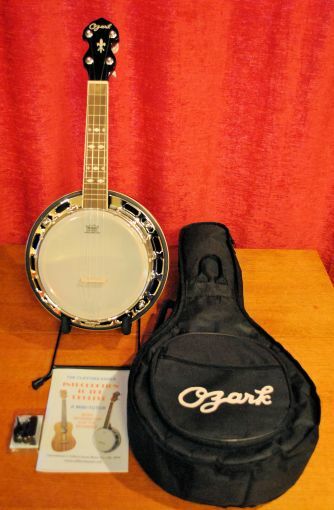 True to their usual high standards this banjo-ukulele from Ozark is very playable and extremely well made. Producing a strong, powerful tone, with genuine banjo resonance. We are extremely particular regarding the imported instrument we choose to stock. The majority of instruments made in Asia leave much to be desired and frankly they require too much work to make them even half playable and presentable. 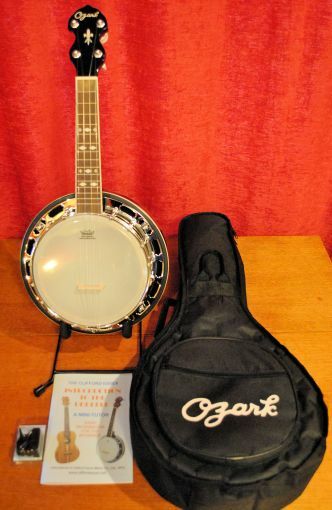 The Ozark range of instruments and the Makala ukulele range are well made and excellent value for money. Even so, we go over each instrument with a fine tooth comb, checking for raised frets (which cause unpleasant, nasty buzzes) and sharp edges, we check that tuners are working properly, that the nut is the correct height and string slots are cut properly. Also, importantly, that the head is fully tightened and the action is good. Often a head is slack (producing an inferior tone), but the action is good. Once the head is tightened it raises the bridge, thus making the action too high. It is then necessary to adjust the co-ordinator rod in order to make the action perfect. Unfortunately most companies import fretted instruments and sell them on exactly as they arrive in the UK. This is bad news, particularly for a beginner who would have no way of knowing if anything was amiss. 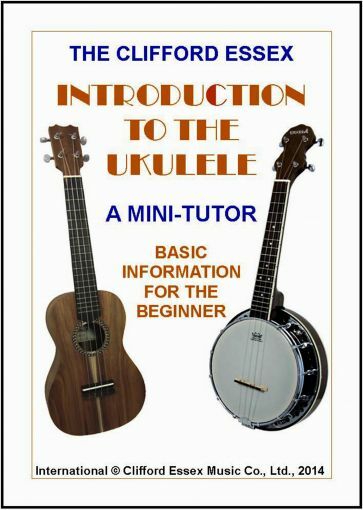 This booklet is intended to be a very brief but useful introduction to the basic technique of playing the ukulele/banjo-ukulele as an accompanying instrument. The tuning used is the most common one: G, C, E, A, and examples are given in both notation and tablature. It cannot be stressed too strongly that a beginner should start by learning the correct techniques of holding the instrument, striking the strings, and the proper position of the left hand. 1. 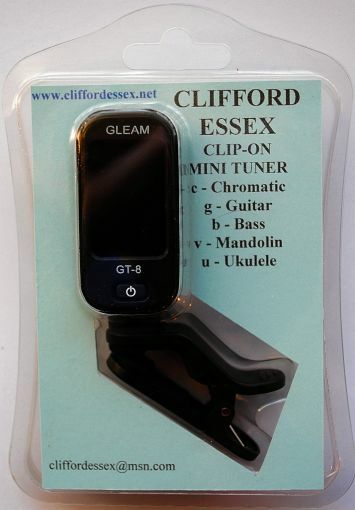 Clip the tuner on to your instrument. 2. Press the power button and hold down for 2 seconds to turn on or off. 3. Press the power button continuously to select tuning mode, then press the button to select the instrument. 4. Backlight turns green and meter points to the middle - in tune. Backlight turns white and meter points left - flat note. Backlight turns white and meter points right - sharp note.